PHOENIX – November 2, 2018 – (BUSINESS WIRE) – GlobalTranz Enterprises, Inc., a leading technology-driven freight management solution provider, today announced its General Counsel Jeff Simmons has been named a finalist for General Counsel of the Year by the Phoenix Business Journal C-Suite Awards. 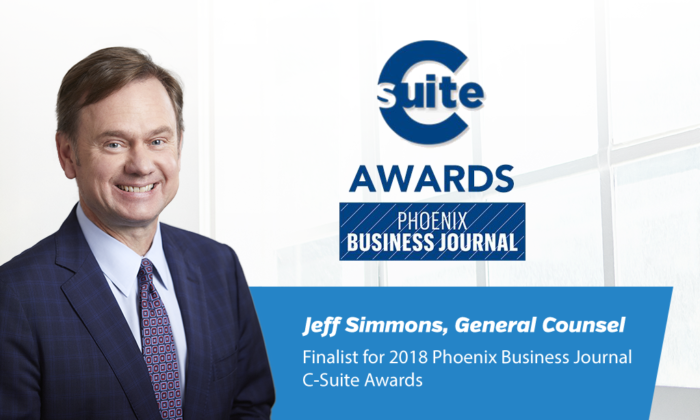 The Phoenix Business Journal C-Suite Awards recognizes Phoenix’s top executives for their contribution and commitment to the community and their outstanding professional performance. Winners were announced at the second Annual C- Suite Awards Luncheon on Thursday, November 1st at the Hyatt Regency Scottsdale Resort & Spa at Gainey Ranch. Simmons was recognized for his leadership in all aspects of the company’s legal matters, including corporate, M&A, regulatory, licensing, intellectual property, litigation, and capital matters. His work is pivotal to GlobalTranz’s expansion efforts and strategic acquisitions, which has contributed to the company’s record revenue and profitability growth. The leadership by Simmons has been integral in GlobalTranz’s seven strategic acquisitions since 2017, including Chicago-based AFN Logistics, Greensboro-based SynchOne, LLC, Dallas-based AJR Transportation, Utah-based Apex Logistics, Richmond-based Worthington Logistics, Minneapolis-based Logistics Planning Services and Milwaukee-based Global Freight Source. Simmons brings 26 years of experience in the transportation industry representing motor, rail, ocean and air carriers as well as brokers, before courts, regulatory agencies and in-contract negotiations. In addition to being named the 2018 General Counsel of the Year by Phoenix Business Journal, Simmons received the prestigious 2017 First Chair Award for Top General Counsel, has been named in the 2011 through 2016 editions of the Best Lawyers in America®, and in the 2015 and 2016 editions of the Southwest Super Lawyers® in the area of Transportation/Maritime Law. In 2014, he received the Transportation Lawyers Association’s Distinguished Service Award. GlobalTranz is a technology and solutions company providing award-winning cloud-based multi-modal Transportation Management System (TMS) products to shippers, carriers, 3PLs and brokers. GlobalTranz is leading the logistics software and services market with innovative products that optimize the efficiency of freight movement and match shipper demand and carrier capacity in real-time. Leveraging its extensive independent agent network, GlobalTranz has emerged as a fast-growing market leader with a customer base of over 1 million product users and 25,000 shippers. In 2018, Transport Topics named GlobalTranz a Top 10 largest freight brokerage firm in the U.S.